Tänavu on liikluses hukkunud rekordvähe inimesi. 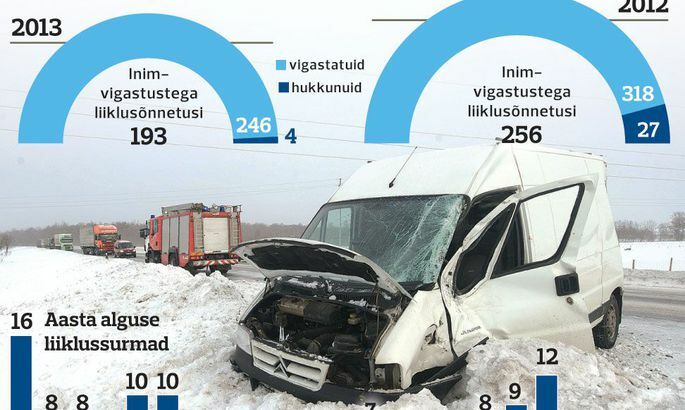 Road accidents in Estonia have caused no deaths in March and the number of fatalities in the period since the beginning of the year is almost seven times lower than a year ago, the daily Postimees said. Tarmo Miilits, deputy director of the Police and Border Guard Board, said that the last fatal road accident in Estonia took place in Viljandi on February 26 and the present period is the most peaceful in road traffic in the past half-century. He said that if last year was second after 2011 in terms of positive road casualty statistics, then this year definitely is the most peaceful year in the past 50 years. Four people have lost their lives on Estonian roads so far this year, compared with 27 during the same period in 2012. The number of road accidents in which people sustained injuries is 194 so far this year compared with 256 in 2012. Miilits said road safety depends on weather and road conditions, technical condition of vehicles, participants in road traffic, and to an extent of 10-25 percent on the actions of the police. He said that while the relatively bad condition of roads was curbing the average speed of vehicles, it increased the number of fender-bender accidents. Besides the free public transport available in Tallinn since the beginning of the year has reduced intensity of traffic and thereby the number of road accidents, he said.